This page has coordinated pieces from Ayala Bar's SPRING 2018 Collections Danube (classic), Seine (classic), Volga (classic), and Daylily (classic) ! 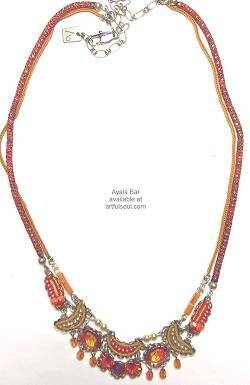 About the Spring Colors on this page of Ayala Bar jewelry! Danube (classic) . 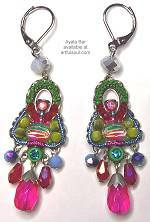 . . Multicolor of grass green, fuchsia pink, ruby, periwinkle blue, lemon-lime in detailed beaded mosaic patterns. Seine (classic) . . . Monochromatic mosaic pieces in shades of orange, from tangerine to peach, with deep golden tan hints. Volga (classic) . . . Softly gray lavender and sage green, hints of mauve and lustrous silvers. Daylily (classic) . . . Bright and soft greens, gold and rose gold, softened by more subtle shades of the same colors. Single ornate design covered with mosaic in beads, a striped pattern under glass at center, sparkling faceted beads dancing below. 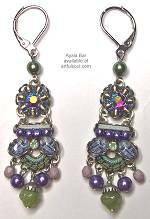 Tiny beaded details extend from open teardrop center mosaic, strands of beads and mosaic elements, colored wire coils, all meet an aqua mesh ribbon-like chain at each end. Bright mosaic top with metallic pink bead frame holds slightly larger mosaic that has striped print under glass, dancing faceted bead fringe below. Two mosaic elements tape and join together for graceful shape and gentle movement. Top features crystal, color metal coil and ribbon, with a print under glass centering mosaic below. Dancing faceted bead fringe under it all. Curving at front are various mosaic shapes filled with print under glass, crystals, beads and color cord. At each end they join to a dark rose mesh ribbon-like chain and golden tan cord until reaching back clasp and chain. Crystal framed by metallic beads at top, holds triangular mosaic that has prints under glass, color coils and crystal, dangling beads below. Super slender packed with color from single crystal top, elongated triangle of crystal, metallic beads and color cord, finishing with dancing beaded fringe. Crystal framed by beads at top, element below spans outward with prints under glass, chain and cord accents, beaded fringe. Shiny from metallic chains in rose gold and bright green colors, that work around and between sublte green beads and dancing crystal fringe. Curving mosaics with bright metallic coils in green and rose gold colors, filled with tiny glass beads and an elongated oval print collage under glass. Off the centerpiece are a strand of mauve bends and green flexible chain.